Summary: Brain responses from 6 month old infants with an inherited dyslexia risk differed from those without the risk factor and also predicted their reading ability later in childhood, a new study reveals. A study conducted at the Department of Psychology at the University of Jyväskylä, Finland and Jyväskylä Centre for Interdisciplinary Brain Research (CIBR) has found that the brain responses of infants with an inherited risk for dyslexia, a specific reading disability, predict their future reading speed in secondary school. The longitudinal study looked at the electrical brain responses of six-month-old infants to speech and the correlation between the brain responses and their pre-literacy skills in pre-school-age, as well as their literacy in the eighth grade at 14 years of age. The study discovered that the brain response of the infants with an inherited dyslexia risk differed from the brain responses of the control infants and predicted their reading speed in secondary school. The larger brain responses were related to a more fluent naming speed of familiar objects, better phonological skills, and faster reading. – The predictive effect of the infant’s brain response to the reading speed in secondary school is mediated by the pre-school-age naming speed of familiar objects, suggesting that if search of the words from the mental lexicon is hindered before school age, reading is still tangled in secondary school, states researcher PhD Kaisa Lohvansuu. 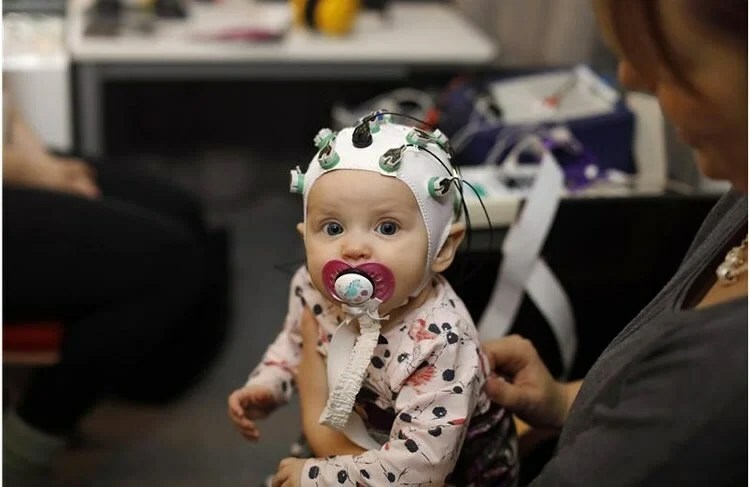 Babies’ brain responses were studied in the EEG laboratory of the Department of Psychology at the University of Jyväskylä, Finland. NeuroscienceNews.com image is credited to Petteri Kivimäki. As speech stimuli, the current study used pseudo-words, i.e. words without meaning. The pseudo-words contained either a short or a long consonant (a double consonant). Phonemic length is a semantically distinguishing feature in the Finnish language, and differentiating it correctly would therefore be essential. However, the correct reading and writing of these contrasts have previously been found to be particularly difficult for Finnish dyslexics. The research was carried out as part of the Jyväskylä Longitudinal Study of Dyslexia (JLD). Half of the children who participated in the project had an inherited risk of dyslexia. Image Source: NeuroscienceNews.com image is credited to Petteri Kivimäki. University of Jyväskylä “Infant Brain Responses Predict Reading Speed During Later Childhood.” NeuroscienceNews. NeuroscienceNews, 11 December 2017. University of Jyväskylä “Infant Brain Responses Predict Reading Speed During Later Childhood.” http://neurosciencenews.com/infant-brain-reading-speed-8156/ (accessed December 11, 2017). Dyslexia is a neurobiological disorder impairing learning to read. Brain responses of infants at genetic risk for dyslexia are abnormal already at birth, and associations from infant speech perception to preschool cognitive skills and reading in early school years have been documented, but there are no studies showing predicting power until adolescence. Here we show that in at-risk infants, brain activation to pseudowords at left hemisphere predicts 44% of reading speed at 14 years, and even improves the prediction after taking into account neurocognitive preschool measures of letter naming, phonology, and verbal short-term memory. The association between infant brain responses and reading speed is mediated by preschool rapid automatized naming ability. Therefore, we suggest that rapid naming and reading speed could share a similar cognitive process of automatized access to lexicon via phonological representations, and brain activation to speech sounds in infancy probably acts as an index of deficient development of the same process.